The year 1524 was very important for Walter and his contributions to the Lutheran Church. 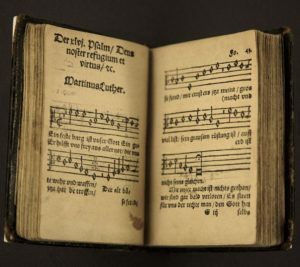 The second important thing Walter did in the year 1524 was to help Luther prepare a new liturgy. It wasn’t really new. But at that time, the church service was sung only in the Latin language-which most people did not know-and things contrary to Scripture had invaded the church service, which gave the impression that worship consists of our doing things for God rather than of God’s giving things to us. Luther was preparing a service that would (a) be in German (the language the people could understand), and (b) get rid of the errors.